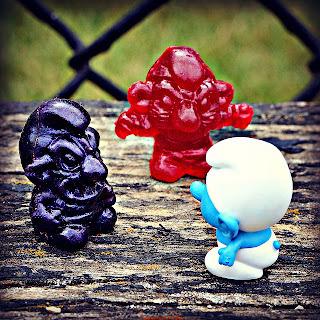 Little Weirdos: Mini figures and other monster toys: The Murks: Smurfs gone bad! The Murks: Smurfs gone bad! Did you ever find yourself rooting for Gargamel when you watched The Smurfs? Maybe even a little bit? Well then, allow me to introduce you to the Murks. These 1" rubber figures are among the latest creations from Jimmy Rommel/Ironhaus Productions--and by putting a dark spin on the famous stubby, hat-wearing, blue-skinned creatures--tap into the same kind of parody fun that makes something like Garbage Pail Kids so appealing. Or Trash Can Trolls (does anyone else remember Trash Can Trolls?). There are currently two different Murks available as a pair, with Jimmy mentioning on his blog that a few more sculpts have been in the works and may become available depending on how the first ones do. I especially like how one of the Murks appears to be a twisted version of Papa Smurf! They're pretty well-timed, too, since Jakks recently released their Smurfs Micro Village mini figures. Which means that now you can have some demented fun by using the Murks terrorize your Smurfs village. 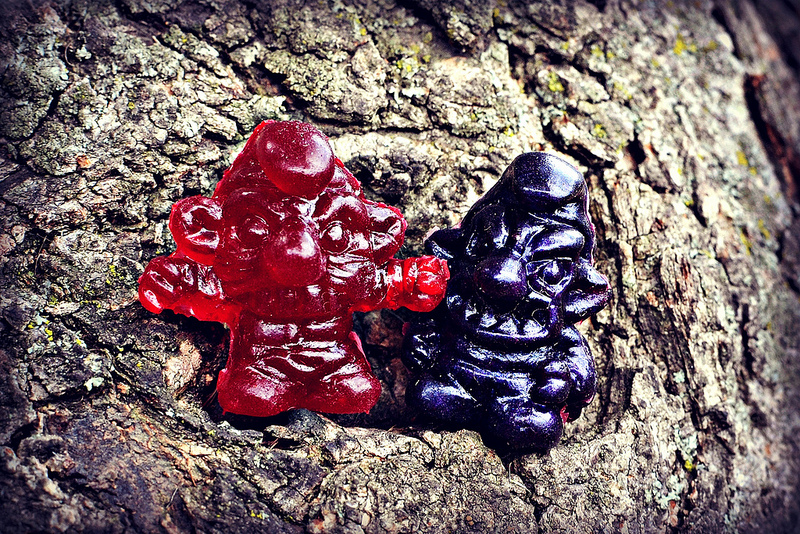 So, if you'd like to enrich your life by way of cool, mini, rubber, evil, Smurflike monsters, you can head on over to the Ironhaus store and grab some of these little weirdos for yourself. That red one looks tasty, like a gummibear! I think I've gotta pick up a set next time Jimmy releases the micro bastards. Haha yes! I like toys that look like candy.